For the past eight years folks have been retreating to Spanish Peaks International Celtic Music Festival in Huerfano County, Colorado, to enjoy an extended weekend of traditional (trad) Celtic music, dance, and camaraderie. Veterans of the festivals mark their calendars and look forward to return to this truly unique destination and event. Anticipation builds as the festival nears and senses fill with excitement – they can see it, hear it, feel it, smell it and taste it. Soon they will be spending time with some of Celtic music’s hall-of-famers and will also be introduced to emerging artists. They’ll meet up with old friends and make new ones ,because that is what Spanish Peaks is about. More and more casually interested and novices to the “trad” scene are coming also to experience the Spanish Peaks buzz. Though the Festival is countywide, it is designed as a boutique offering with an a la carte menu. There are plenty free activities as well as ticketed events held indoors and outdoors. You can build a feast of concerts, workshops, and sessions or just sample some of the demonstrations and performances. Many musicians will arrive early and some take part in the Festival outreach programs for all of the county schools of Wednesday September 25. Official activities begin Thursday, September 26, in Cuchara during the day and Gardner at night. On Friday most of the activities turn to La Veta and Walsenburg. The unofficial opening event is a free picnic/ceili/party at “UpTop” ghost town saloon on old Le Veta pass, noon-3PM, on Friday, the gorgeous drive alone is worth the effort! Take a drive along the Highway of Legends and spend some unforgettable time in Historic Huerfano County and celebrates the richness of its Autumnal glory in Spanish Peaks country. Whether you come for a day or stay the weekend you’ll be impressed by the quality of musicians, teachers, and programs offered by the fest. Who/What: 8th ANNUAL SPANISH PEAKS CELTIC FEST & RETREAT w/Tannahill Weavers, Roy Gullane, Phil Smillie, John Martin, Colin Melville, Robbie O’Connell, John Doyle, Chris Newman, Maire Ni Chathasaigh, Park Stickney, Máirtin de Cogain, Duncan Wickel, Cassie and Maggie MacDonald, Ashley Davis, Sean McComiskey, Adam Agee, Jon Sousa, Folk Ragoût , Leslie Anne Harrison, Frédéric Pouille, Arlene Patterson, Christina Tourin, John Crumlin, Jim Remington, Tanya Perkins, Margot Krimmel and more..
What: Concerts, Workshops, Sessions, Music, Song, Dance, and Stoytelling! 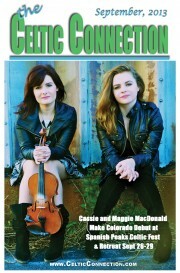 Discount Advance Reservations available on line at www.CelticMusicFest.com, or call 719-742-5410. Reservation form is also avail in the center section of this September issue of the Celtic Connection. Ashley Davis grew up listening to her parents’ vinyl recordings of folk music—concentrating on the lyrics and listening carefully to the message in the song. The ability to tell a story—a story that would capture and hold your attention was important. Of course, growing up in Kansas, Davis was also exposed to country music and bluegrass and these genres also prized the ability to tell a story. She became a serious student of the craft of songwriting and decided that she wanted to be a songwriter. However, it wasn’t until just before Ashley was going off to school in Nashville—to learn the craft of songwriting—that everything changed with just one CD. A Connie Dover CD that really resonated with Ashley when she heard it. “The way that Connie Dover’s singing made me feel is how I wanted people to feel when they heard my music”, Davis explained. “It was in her phrasing and delivery—I hadn’t heard anything that affected me that way previously. Subconsciously I must have absorbed it, because people would always ask me when I sang where my Irish influence was coming from—it all had to do with the phrasing and delivery.” After hearing Dover, Ashley started listening to every female Celtic singer she could. Davis has a powerful and compelling voice and could have simply become a vocalist—learning the traditional ballads and singing them to great effect. But that was the easy path. Ashley was not content with being a singer—she wanted to be a songwriter—a much harder path to walk. It helped that she was a lover of words—of literature, poetry and all the ways that words can make magic. She took words and phrases and reworked them into something that seemed very old, but was entirely new and different. By her third album, she decided to stop trying to work within the box and just do what she wanted in terms of instrumentation and songs. “Songs Of The Celtic Winter” consequently went on to garner the most acclaim of all her releases, so her gut instinct seemed to be correct. But it was always a struggle to get across the fact that the lyrics and the songwriting was the most important thing for her. She did a Masters of Traditional Music at the World Music Centre at the University of Limerick—and even there she had to fight to be able to pursue her goal of song writing. Ultimately they listened to her and asked who she would like to work with. “John Spillane” was the answer and they brought him to the University for a workshop in songwriting. Ashley Davis will be making her Colorado debut at the Spanish Peaks International Celtic Music Festival at the end of September in La Veta Colorado. 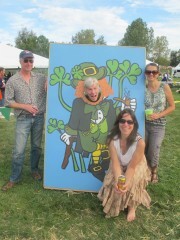 Now in its 4th year, the small but mighty Celtic Harvest Festival Edgewater continues its tradition of being the biggest little Festival in Colorado. With a small-town feel appropriate for its location in Citizens Park in Edgewater, last year the Festival attracted a massive crowd of 10,000 (over its two-day run, not all at once…) and continued the tradition of featuring only home-grown Colorado bands (of whom there are many, many more than you might think!). That same practice continues this year with a lineup that offers Kindred Spirits, Mythica, Billy the Mountain, Keep Britain Irish, Celtic Winds, O’Neill’s Fancy, Sherman Woods and crowd favorites Angus Mohr and Colcannon, both back for return engagements. In addition, the Colorado Youth Pipe Band and Highland Dancers will perform along with the Heritage Irish Stepdancers, Wick School of Irish Dancers and dancers from the Colorado Welsh Society. The Festival opens on Saturday the 21st, 10A-9P and Sunday 22nd 10A-5P and is free, so you can attend and spend your time listening to the music, watching the dancers and patronizing the vendors of Celtic art and merchandise, the farmers market with its fresh offerings (it is, after all, the Harvest Festival), watching the dogs of the British Isles and raptors from HawkQuest, being awed by the Scottish Village of the Renaissance Scots and visiting the tents of the Scottish Clan village. Come one, come all to Citizens Park, 22nd and Benton in Edgewater, two blocks west of Sheridan and Sloan’s Lake Park. More than 80,000 people are expected to attend this year’s 37th annual Longs Peak Scottish-Irish Highland Festival, taking place September 5-8 at Stanley Park Fairgrounds in Estes Park. The festival kicks off Thursday night at 7:30 p.m. with Tattoo Estes – a one-of-a-kind parade ground concert that feahues military and pipe band s. This year’s program celebrates the 60th anniversary of the Korean War and will include the ScottishPower Pipe Band, Band of America’s Few, Bermuda Regimental Band, Colonial Williamsburg Fifes & Drums, Fountain City Brass Band, Queen City Pipe Band, Fort Collins Pipe Band, Pipedance and many more. It will also take place on Friday and Saturday evenings at 7:30 p.m. 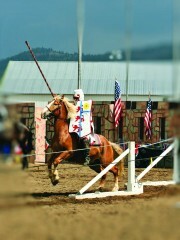 World-class Jousters headline the festivities as they vie for the sport’s largest purse in what is considered to be the “Super Bowl of Jousting” . This competition features skill and accuracy events as well as the heavy armor competition. The Highland games showcase equally talented athletes displaying amazing strength and vying for the U.S. and international pro and amateur championships in the caber toss, hammer and stone throw. For more information and to order tickets, call 1-800-90-ESTES, visit www.scotfest.com or go through Ticketwest at any King Soopers location.